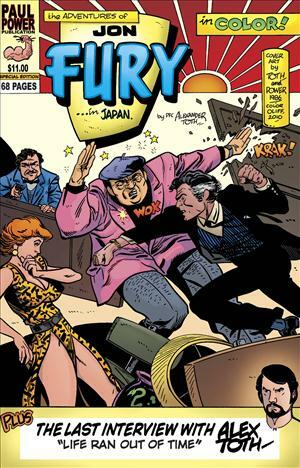 While searching for the Adventures of Jon Fury in Japan—a collection of a previously unreprinted series by “artist’s artist” Alex Toth that was not carried by my local comic-book store—I discovered it was available online at Stuart Ng Books. Fortunately, the company’s storefront is not too far from me in the Southbay area of L.A., so I was glad to save the shipping and take a trip down to the store to pick up the issue. This also was a perfect excuse for me to visit the store for the first time. Though no longer really the norm, comic-book stores used to have the reputation of looking like a boys’ clubhouse, with comics and magazines stored haphazardly in boxes or stacked to the ceiling. (Believe me, I’m not dissing this—the first comic-book stores I frequented back in the 1970s definitely fit this profile, and I have nothing but fond memories of my weekly pilgrimmages to these stores). In contrast, by any standard, Ng’s store is extraordinarily clean, professional, and well-maintained. Located in a newish, non-descript business park in Torrance, a Southbay community in Los Angeles, the bookstore is airy and inviting, conducive to browsing. In addition to artbooks that feature the work of a wide range of cartoonists and illustrators, there are also plenty of European graphic albums (many imported, meaning they’re not translated), sketchbooks by fan-favorite artists, and classic comics collections. Many of the items are rare and hard to find—indeed, I was interested to discover items I personally already own for sale at prices that reflect their rarity and desirability. Along the same lines, I spotted a book available there that was out of print at Amazon. 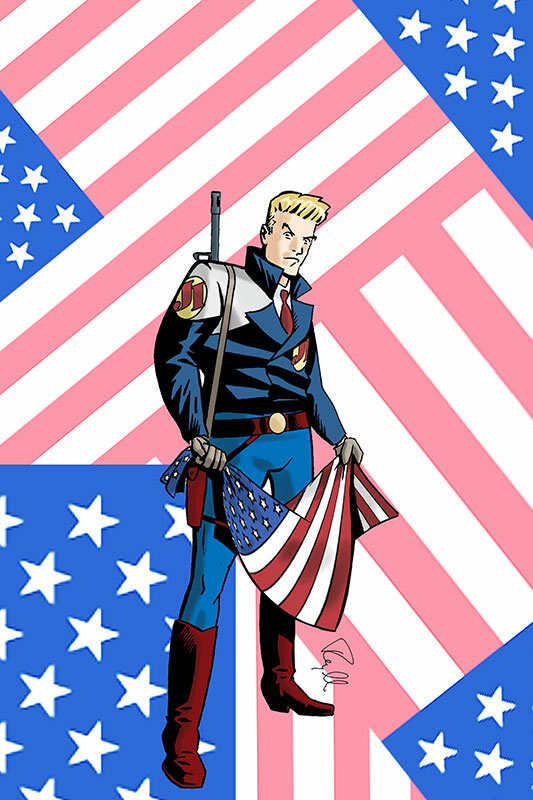 Anyone with an interest in cartooning, comics, commercial art, and illustration definitely owe it to themselves to visit the store if they are local or the website for hard to find items and collections. Visit the Stuart Ng Books website for address information and directions. This was my son's first time on skates! My son wore a tie to the White House, just in case he met the President! Partly for this reason, we spent a surprisingly brief time at the National Mall. I actually was in DC on business for a conference the first few days. At the end of the first day, having been indoors all day at the hotel for meetings, when I met the family for dinner that evening, I suggested taking a quick cab ride to the Lincoln Memorial at the Mall. My daughter was thrilled to see where Martin Luther King, Jr., delivered at his address in front of the monument; from there, we walked to the Korean War Veterans’ Monument, and the new World War II Veterans’ Monument. As it began to get dark, we hopped back in a taxi for our hotel near Dupont Circle for dinner. In retrospect, it’s good we made this quick visit, because we never found time to return and explore the other monuments at the Mall! Though I would like to have seen the Jefferson Memorial, the Vietnam War Monument, and the FDR Memorial, they’ll have to wait for another trip. In any case, I wasn’t disappointed! The exhibits there included “Abraham Lincoln: An Extraordinary Life,” the First Ladies exhibit (a lot of gowns! ), the American Presidency, Julia Child’s Kitchen, and an exhibition about Thomas Alva Edison and science in America. The Lincoln exhibit and another called the “Price of Freedom: Americans at War” (stretching from the French-Indian War to the War in Iraq) were especially memorable. The permanent display of the Star Spangled Banner flag, which inspired Francis Scott Key to pen the poem that became the national anthem, was also impressive, partly because I was shocked by the flag's huge size! The next day, we drove a rental car to George Washington’s residence and plantation at Mount Vernon, which is about 12 miles outside Washington, DC. 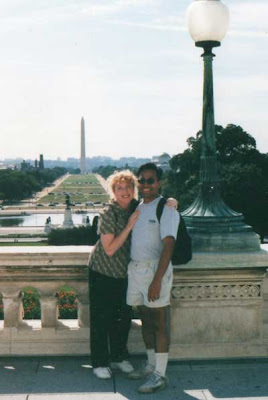 My wife and I visited Mount Vernon in 1998, but we were impressed by the changes since then. A huge state-of-the-art museum was completed there in 2006, but it’s mostly underground to preserve the original grounds. Mount Vernon is one of my favorite historical places. It has a spectacular view that overlooks the Potomac—when you stand on the back porch of the main house atop Mount Vernon which looks out over the river (especially on a stifling summer day, as we did back in ‘98), you get a real sense of what it must have felt and looked like to George and Martha Washington back in the 18th century. It helps that the community has kept the surrounding area in its original state, including the woods across the river. I thought we would visit Mount Vernon for just a few hours then go off to see something else later in the day, but it was so interesting and immersive, we ended up staying there the whole day, arriving at 9:30 a.m. and leaving near closing time at 4:45 p.m.! Mount Vernon has also made an effort to deal with slavery honestly and directly. Slave quarters have been preserved and a monument to the slave population at Mount Vernon (and a discovered unmarked cemetery) has recently been erected. (One changed we noticed since 1998 is a reference in plaques and in the brochures to the slave population as “enslaved people” rather than “slaves.”) It was fascinating learning about Washington’s life as a farmer, which he considered himself even before a soldier or statesman. The White House tour was primarily restricted to the East Wing, but it was still a thrill to be inside. We learned one room was about to be closed for an event that Michelle Obama was hosting. A uniformed Secret Service agent in one of the rooms even graciously let our children behind the security rope so that they could get a close up view of a painting of George Washington while he pointed out interesting features of it. This is the same painting that has been in the White House since 1800 and was saved by Dolly Madison when the British burned down the structure during the War of 1812. At the same time we were on our tour, we noticed a Secret Service man giving a personal tour to two Russian dignitaries, who were accompanied by an interpreter to translate what the Secret Service man was describing. After we returned the car, we took the Metro back to the U.S. Capitol for a tour that was given to us by the Congressional staffer who set up the tour. Since we met her at the Congressman's Office in one of the outlying executive office buildings for Congress, we used the underground tunnels that connect the Congressional buildings to the Capitol It was nice to have a personal tour by a Congressional aide; she also got us tickets to sit in the House and Senate chambers. Although not much was going on, we saw Minnesota Senator Al Franken presiding over the Senate chamber. The kids were really quiet and respectful, even though my 5-year-old son said afterwards, “It was boring!” But he was quiet and well behaved as we sat in the Senate gallery. Because we didn’t get to the Capitol until the afternoon, we didn’t get to see the main museum there until just before it closed. I would have liked at least one more day in Washington to see it. Anyway, it was a terrific family trip! If pressed, the kids would like say riding the Metro was their favorite activity! ABOVE: Now on prominent display at the American History Museum, this statue of George Washington was one of the first monuments to our first president in the capitol. It received mixed reviews at its unveiling (some felt Washington was "inappropriately dressed" and was of course later replaced by the iconic Washington Memorial. Fortunately, a little rain didn't dampen our enjoyment! Hiking back to the main house from the Potomac at Mount Vernon. "Lafayette, we are here!" I couldn't resist taking this photo in the foodcourt of the Mount Vernon museum. With our car rental at the Mount Vernon parking lot. My little boy got this Civil War era hat at the museum and wore it most of the trip.